Have you ever gotten to Sunday and the realization that another full week of work is ahead of you hits so hard that you feel overwhelmed and sad? You’re not alone. This phenomenon is known as “Sunday Night Syndrome” and it’s actually pretty common. After a day without work responsibilities, it can be very stressful to think about all of the projects and tasks that are waiting for you back at the office. 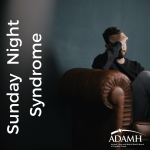 Sunday Night Syndrome can manifest itself in stressful thoughts, trouble sleeping, dread and sadness. All of these symptoms affect our mental health and well-being. Block off time on Friday afternoon to tidy up your office and plan for the next week. Coming in on a Monday morning to papers strewn across your desk and no clear plan to accomplish your tasks creates unnecessary anxiety and confusion. If you’re leaving for the weekend without finishing a project, make a note about where you are leaving off and what still needs to be done. Make a priority list of things to do in the coming week. Create a plan for the weekend. Before Friday, take some time to plan out your weekend. Things don’t always go as planned, but if you lay out all of the tasks you hope to accomplish, you will have a better idea of how much time you would realistically need to get everything done. If laying out your plan seems too packed, reevaluate your expectations and prioritize what things need to be done this weekend and which things can wait. Try to spread out the mundane chores and errands so that you aren’t left with a list of less-than-exciting things to fill your day on Sunday. Get some things out of the way on Friday or Saturday so you can have time to enjoy the day on Sunday. Schedule some “me time.” Take time out every day, especially on Sunday, to do something fun or relaxing for yourself. Even if you can only spare 15 minutes, making the time to invest in yourself can greatly impact your mental wellbeing. Keep a consistent sleep schedule. It is tempting to stay up late on a Friday or Saturday night and sleep later in the day, but this can increase restlessness on Sunday night and make the week ahead that much more daunting. Try to keep a consistent, or similar, bedtime and alarm for each day of the week. Be grateful. If the Sunday evening blues and anxious thoughts start to creep in anyway, try making a list of things you are grateful for. This kind of worry and stress is normal, but if you feel that what you are experiencing is on the next level, affecting your ability to function and lasting for an extended period of time, please reach out to a professional for help. See our list of Network Providers in the ADAMH System of Care for details and contact information for professionals in Franklin County.